Disclaimer: I don't own the characters, I make no money on this. Please don't sue. Spoiler warnings: Slight spoilers for SUPERGIRL series 2, definite spoiler for the last issue of SUPERGIRL. Author's notes: This story ties into some DC stories that were going on at the time, but can be read alone. There is a section where for the sake of length I cut out some dialogue. Despite that, the sense hopefully comes through. Acknowledgments: To Peter David for writing an amazing Supergirl. It was a town in the middle of nowhere, and as Buzz headed off to do ...whatever Buzz was doing, Linda Danvers, better known to the world as Supergirl, was going for a brief walk. The Diner and Rest Stop they had stopped in at their odd road trip seemed peaceful enough. She breathed in the cool mountain air and wondered what exactly she was doing. She seemed lately to have a purpose, but she wasn't entirely sure how well it sat with her, an whether or not it really should be her purpose. Somehow she still had trouble seeing herself as an Earthborn Angel, equipped with Wings of Fire on demand. It seemed, oh, off somehow. Nonetheless it was a part of her now and she would have to deal with it, until she figured out what else she could do. The small area was very quiet, only one other family was around and they were preparing to get back on the road. She smiled as she stretched. As Linda Danvers, no one seemed to even blink at her funny. And she kinda liked that. It felt weird being Linda Danvers for real now... without Matrix as a part of her, she felt very different, almost free. Of course, having fiery wings and being a so-called angel... that carried its share of responsibility as well. She walked across the parking lot behind the diner and onto a small hill. There were a few trees here, and it was very peaceful. As she thought, she let her feet draw her along. Soon she came through an area with a few more trees into a clearing on the hill. the flowers were blooming and the air was cool and crisp. She smiled and was about to settle down on the ground when she heard a throat clearing above her. She looked up and blinked as she saw Kal floating in mid-air, watching her, a smile on his lips. She smiled. "Hello, Superman. What are you doing around here?" "Just coming back from a volcano explosion in Europe. I spotted you an thought I would stop in and say hello. And you know, you can call me Kal or Clark when we are alone." "It is nice to see you..Cla-, Ka-, Superman." She blushed and gave him a hug as he landed and stepped to her and his return embrace was warm. Somehow she still didn't feel like she could call this man by his first name. "I didn't do a very good job of being a friend, before everything happened with Matrix, and I wanted to do a better job. You are a good person and I am proud of you and everything you have done." She felt herself blush under his praise. No matter how many times she met him and his parents, she still felt some awe of him. He had done so much for so many she felt she was in the presence of a hero she could never match. "So where are you headed on this trip? You seem an awfully long way from your new home." "Well... I have a few ideas, and Buzz and I are looking into some things. And, well, I like road trips!" Superman laughed. Linda found herself laughing too, feeling some nervous tension easing away. Superman glanced away suddenly, then smiled. "I have to go, but I will catch up with you later, okay?" And then he was gone, shooting away at high speed and vanishing almost immediately. Linda sighed, and began walking back towards the car. She always felt a little overwhelmed by Superman's presence. Would she ever feel like she belonged in the same league as him? Some days she thought so, and others... not so much. As she walked along, she heard a sound ahead, like a humming, and then what sounded like someone falling a short way and landing hard. Cursing noises in a female voice that sounded familiar led her at a run into a small clearing. There she saw the familiar sight. 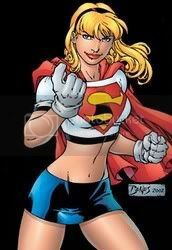 A woman in a white spandex uniform and a cape secured around her neck, with some bruises that, even as Supergirl watched, seemed to heal and fade. The woman's face was screwed up in annoyance as she looked around and muttered under her breath. It was a face she knew, though not as well as she wished. The groaning and cursing figure turned and gaped at her, then smiled wide and laughed aloud. "Supergirl? It's you! Where am I?" Linda was overwhelmed for a moment by Power Girl's enthusiasm. She eyed the other woman and spoke slowly. "You are in the middle of the country. Near a town named Killona. What are you doing out here? Are you all right?" "I'm... a little woozy. Things have been confused for me the last little while. But nevermind that, where have you been the last few days? The last few months rather?" "What do you mean? I have been at home as always." Power Girl looked at her for a moment and then her face seemed to shift, becoming somewhat grim. Linda looked at the other woman blankly and then felt her own face go slack for a second, before gulping. Power Girl's face seemed to drain completely of color and she staggered, then looked at Linda so intensely that Linda felt herself blush and a deep sense of foreboding fill her. Power Girl's look slowly smoothed out into something like determination and she began to speak. "Well, that explains a few things, and gives me a chance to change them. I am from the year 2005, and I have a story to tell you. There is something you need to know, Supergirl... Linda... and I don't know how long I have, so please just listen. Much of this I got from Superman, the Martian Manhunter, and others. It will begin in a few months..."
As Power Girl spoke, Linda felt her mind boggling at the things Power Girl was telling her. They seemed impossible and yet... she could tell the other woman was telling the truth. It was impossible and yet this woman was from the future. And if she was right, things were about to get... bad. The last few paragraphs Power Girl related seemed even more impossible than the beginning but they also sounded very true to her... and they rocked her to the core. As she listened, she found herself resolving to change things, to make them better, and to set a few things right. She felt her own self-doubt melt away and it was replaced by something else, a sense of duty and of hope. "-and you vanished. Other than the note to Kal, there was no sign of you again. And I hope, now that you are forewarned, that won't happen." "Thank you, Power Girl. Some of this sounds so overwhelming but at the same time... I believe you. And more, in what you have told me, you have shown me a lot of tragedy, but also, a lot of hope. I don't know how to thank you enough, but thank you anyway. On another idea, one you have inspired, and on the note of changing things: You told me your powers were once again cosmic level, could you lend me a hand with something?" Power Girl looked at her oddly but smiled. "It would be my pleasure. And the name is Kara." Linda stretched in the unfamiliar uniform, the fabric slowly adapting to her body and becoming very comfortable. She smiled as she looked in the mirror. Now she was ready to make things better. With a firm nod she turned to Power Girl. "It looks wonderful on you, Linda." "Thank you, Kara, for everything." "It was my pleasure. I have watched you and I am not willing to watch a good hero get sideswiped." "Well, thanks to you, I wont." Suddenly Power Girl seemed to shimmer and shift. She looked down at the arm she had shown Linda earlier, which was glowing. She shook her head and looked back up at Linda. "Looks like my time is up. I hope everything goes well for you. Remember what I told you..."
And she faded from sight just like that. Linda spent a few moments scanning the area, but there was no sign of Power Girl. She sighed and closed her eyes. "Well, wherever you are, Power Girl, thank you, and may you land on your feet!" She strode out of the room and took off into the sky. Buzz looked up from leaning against the car as he heard a swoosh. His eyes widened as he saw Linda hovering above him, looking down at him disapprovingly and in a totally different costume. "We are headed home, Buzz. And from now on, don't call me Supergirl. The name is Superwoman." She lifted Buzz up and took off into the sky, Buzz sputtering all the while. But she didn't really care. She had begun taking control of her life and her destiny. And the future was unwritten now, and she was going to make it a good one. Origin of reference image unknown.